Timothy Hunter is a 13-year-old boy with the possibility of becoming the world’s greatest magician–as long as he can survive his first date. Well, that and his alcoholic, guilt-ridden father. Well, not really father, kind of like a foster father, because his real father was Tam Lin (of the legend), and his mother is the Faerie Queen. Not to mention his future self, and a bunch of demons from hell that look suspiciously like Barney the Dinosaur. Confused yet? As the classic TV show Soap used to say, if you aren’t, you will be. Comics are somewhat similar to soap operas, and that’s not knocking either genre. I loved The Edge of Night when I was 16-17, because it combined a cast of characters that you could look forward to following with very mysterious plots (murder, blackmail, etc.) I would have loved to have been able to see Dark Shadows, which I only encountered as a Gold Key comic in my youth. “The Books of Magic” and Timothy Hunter were created by Neil Gaiman and John Bolton, and they share some affinity with both men’s other work, although Reiber is quickly establishing his own voice. Perhaps it is similar to the Sandman stories written by other writers in the recent HarperPrism anthology co-edited by Gaiman and Ed Gorman? Part of the reason I like this series is because I recall daydreams around the age of 13 where I was a powerful magician, similar to Timothy, and it is interesting to see my daydreams committed to page in text and pictures. 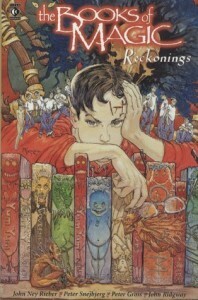 For people without my strong sense of nostalgia, the humor and style of The Books of Magic raises it above much of the other graphic novels published today (although nothing comes close to Jeff Smith’s Bone, which is a 1990s Pogo, and will likely be considered as much a classic in the comic field as Watchmen if Smith can keep up the quality).